A high effective recirculating air system is provided. The filtered air, heated electrically, is re-circulated with fresh air in selected proportions for optimum drying. Uniform air circulation, controlled temperature, sturdy construction and large working space are the valuables of the oven which is suitably designed to cover wide temperature range. Loading and unloading is faster and simple. In higher capacities trays trolley rolls in and out of the chamber. For continuous operation a spare trolley can be had for loading while the drying cycle is taking place. Vitro Drying oven is fabricated out of rigid angle iron frame with double walled panels insulated with best quality compressed fibre glass and with a rigid door fitted with strong things and best choosen locking arrangement. A control is fixed in front of the oven to facilitate the operation easily. It has a large working space and is available in good finishing in synthetic enamel colour. Inner walls are painted with heat resistent paint to resist temperature up to 300 degree. 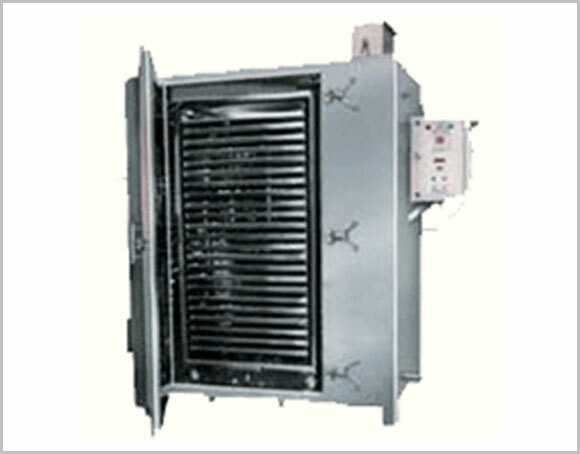 The Drying ovens are electrically heated and thermostatically controlled. It is fitted with timer to facilitate working day and night. Dryers are well accepted for fast economical drying of powders, bottles, & other materials. Dial thermometer and a thermostat/digital temp controller with time switch are supplied to facilitate working day and night.